Yes...HERSHEY! Inside each croissant are three Hershey's kisses. So yummy when served warm! 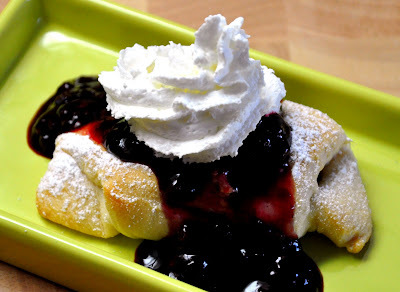 This recipe is found on the Hershey's baking website...but after the suggestion of adding blackberry sauce and whipped cream from a friend, here is it, tweaked a little bit. Place first three ingredients in saucepan. Turn heat to low and stir occasionally, smashing blackberries as they thaw. Once there is some liquid in the pan, turn heat to medium. Continue to stir and smash the berries. When mixture becomes bubbly, stir for another 2 minutes. Turn heat to low and simmer another minute. Mix in lemon extract and taste for sweetness. Add additional sugar to taste if necessary. Makes about a cup and a half of sauce, so I make about 24 croissants with this amount of blackberries. I'm sure you could use canned blackberry sauce too.